Osaka is usually considered Japan's "second city," after the sprawling megacity that is Tokyo. But it’s fruitless to compare the two, because what makes Tokyo a metropolitan gem is vastly different from what makes Osaka one of Asia’s most vibrant and eclectic modern destinations. Located along Japan’s inland sea, Osaka has long been considered the country’s entertainment hub, a center of business and pleasure historically dominated by a merchant class with extra cash to spend. An in-your-face quality distinguishes most things in Osaka culture — the food is heartier, the streets a bit seedier, the people friendlier and more candid than in other parts of Japan. 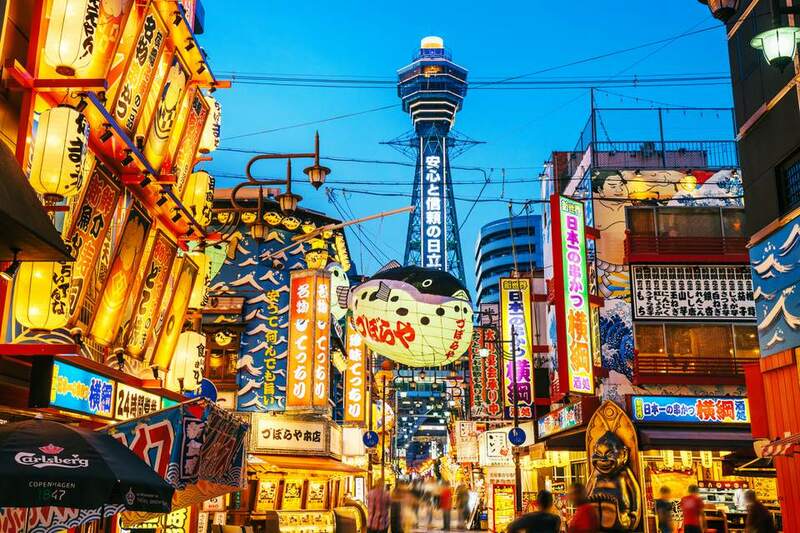 Osaka is teeming with activities for every kind of traveler, and the following list represents the top things to do including the best sites, experiences, and culinary attractions. Unbeknownst to most of the world, Osaka is a revelation in Japanese cuisine. Modern foodies have nothing on native Osakans, who are so obsessed with food that they are known to live by the slogan of kuidare — which means eating until you drop, or until you go bankrupt (whichever comes first). Okonomiyaki is a savory pancake stuffed with green onions, meat, octopus, squid, and/or veggies. The best places to try this hybrid flapjack are around Osaka’s busy Nanba station. Try your best to get a seat at Ajinoya, a cozy spot where you can watch chefs prepare the dish behind the counter, or head straight to Okonomiyaki Mizuno, another popular spot with a slightly shorter queue. Osaka Aquarium Kaiyukan is a city unto itself. Visitors can spend almost a full day reveling in the 16+ replicated environments, including an Ecuadorian jungle, the Tasmanian sea, Monterey Bay, and the Great Barrier Reef. Arranged in a descending spiral around the aquarium’s most sizable indoor tank are other tanks representing the Pacific Ocean’s seismic “ring of fire.” In addition to sea otters, spindly crustaceans, and some shocking deep-sea creatures, Kaiyukan houses two whale sharks, the largest known fish on the planet. Leave enough time to admire the ethereal columns of jellyfish, which float breathlessly in tall crystalline tanks towards the end of the final exhibit. The city’s most famous landmark, Osaka castle actually functioned as a military arsenal during World War II, and unfortunately suffered significant damage in the war’s relentless bombing raids. The most recent renovations, completed in 1997, have more or less restored the structure to its Edo-period glory. The five-storied tower — about 138 feet (42 meters) tall —contains a museum displaying armor, weapons, and other historical artifacts. Enclosed by moats and ivy-covered walls, the castle grounds are especially picturesque during cherry blossom season. After visiting Osaka Castle, it’s worth stopping at the Fujita Museum, which harbors an array of very precious tea ceremony objects. There’s also the stunning Kamigata Ukiyoe Museum which contains some of the rarest Kamigata — a style of wood prints unique to the Osaka-Kyoto region. Interested persons can even enroll in a short course on the basics of woodblock printing (classes must be booked at least three days in advance). The Osaka Municipal Museum of Art, located in scenic Tennoji park, is renowned for its collection of over 200 paintings from 9th through 13th century China, and its vast repository of Chinese ceramics. Shinsaibashi shopping arcade is Osaka’s answer to Tokyo’s Ginza district, a consumerist paradise and the city’s most exciting area. For the full experience, arrive in the late afternoon or early evening, when the promenade is at its sensorial peak. As you walk south from Shinsaibashi station, you’ll come to realize why Osaka has been referred to as Japan’s commercial center. After seeing the main thoroughfare, split off on to the quieter side streets, where you’re bound to rub shoulders with suit-clad salarymen drifting from bars to late-night eateries. Along with okonomiyaki, takoyaki is often called Osakan “soul food.” These savory balls are made of a flour-based batter filled with small pieces of octopus (tako), tempura bits, red pickled ginger, green onion, and are topped with a generous sprinkle of dried bonito flakes. Watching takoyaki chefs poke batter into small spheres using two chopstick-length picks is pretty hypnotizing. Two of the best takoyaki shops are conveniently located near Umeda train station, one of Osaka’s main transportation hubs. The first is Takohachi, a good place to sit down with a beer, and the second is Aiduya, a place that offers an unconventional dipping broth. Next to Shinsaibashi is Osaka’s Dotonburi neighborhood, a good place to flex your kuidare attitude, and dine and imbibe until you drop. Be on the lookout for restaurants or stalls serving kushi katsu (deep-fried skewered meat and vegetables), and ikayaki (squid pancakes). Dotonburi also has the original Kani Doraku restaurant, famous for its seafood and gigantic animatronic crab that moves its legs and eyes to the delight of waiting customers. But perhaps the most famous Dotonburi mascot is the Glico Running Man, whose figure shines among other neon advertisements on a Times Square-esque display that faces the Tombori river. The Umeda Sky Building is actually two buildings, linked at the top with a “floating garden observatory” that offers some excellent panoramic views. Visitors take the elevator to the 35th floor, and then take a different escalator to the observatory deck on the 39th floor. If you’re afraid of heights, perhaps it’s best to head in the opposite direction — underground. Below Umeda station is a dizzying labyrinth of shops, bars, and cheap restaurants. Allegedly, the basement of every large building in withing a 1-mile radius has been connected to form a maze of commercial activity. Start your subterranean journey from the basement of Osaka’s famous Hankyu department store. If you’re lucky enough to visit Osaka in March, don’t miss sumo wrestling’s Grand Tournament. The opportunity to see live sumo is relatively rare, as matches are held in just four cities across Japan, and tournaments take place only a few months of the year. The rules are simple — the wrestler must force his opponent out of the ring, or make him touch the ground with any body part other than his feet. Winning moves are announced immediately after each bout. Osaka is home to Universal Studios Japan, which boasts a Harry Potter world that might be more magical than the one in Orlando or Los Angeles. The Wizarding World of Harry Potter has dozens of attractions for both kids and adults, including a Hippogriff roller coaster, Hogwarts castle, and Hogsmeade village. Tourists line up in droves to purchase Butterbeer, a drink that has gained unprecedented popularity in the Japanese muggle world. In the Nipponbashi district is the National Bunraku Theater, a center for the traditional art of puppetry. The most popular bunraku plays were written by Osaka native Monzaemon Chikamatsu (1653-1724), the Japanese counterpart to Shakespeare. Each puppet is controlled by at least three puppeteers, who wear black and work in full view of the audience. While all the dialogue is in Japanese, English interpretation devices or English-language programs are available. The Museum of Oriental Ceramics contains over 1,000 pieces, mostly from Korea and China. Located in the garden on Nakanoshima, an island in the middle of the river that runs through the city center, the collection houses two National Treasures designated by the Japanese government. If you’re feeling inspired after your visit, head to the Maishima Pottery Museum. The artists here are committed to using marine clay from Osaka Bay — much of it unwanted refuse from the construction of Kansai International Airport. There’s nothing quite like Spa World, Osaka’s very own super-sized public bath. There are at least eight saunas, and 14 onsen (hot spring baths), divided into the “European Zone” and the “Asian Zone.” The swimming pool is complete with two twisty slides, not for the faint of heart. If you forgot to pack your bathing suit, you can rent one from the front desk. Guests are encouraged to use the facilities for as long as they like — making this a fun alternative to spending a night in a regular hotel. The Cup Noodles Museum, also called the Momofuku Ando Instant Ramen Museum, is where you can learn about the history of your favorite sodium-packed snack, and even design your own unique Cup Noodles. From selecting the packaging to choosing the toppings, you’re completely in charge of creating the noodles you’ve always dreamed of. Learn about the invention of chicken ramen, the classic Cup Noodles, and Space Ramen, a dry ramen for astronauts. The smaller Hozen-ji temple is often omitted from Osaka guidebooks, but it’s a shame to miss place, which offers a peaceful interlude in a visit to the busy Dotonburi neighborhood. The temple’s main deity is Fudo Myo, whose typically fierce exterior is obscured by lush green moss. The more impressive Shitenno-ji temple is actually Japan’s oldest, complete with a dramatic five-story pagoda, while the Shinto Sumiyoshi Shrine is notable for its pre-Buddhist style architecture. In the summer, the Osaka Tenmangu Shrine hosts the Tenjin Matsuri, the city’s largest traditional festival. Locals dress in summer kimono and festive costume, and portable shrines are paraded through the streets and on to “procession boats” on the Okawa river. There are also stage boats on which actors perform noh and bunraku plays for eager onlookers. The Osaka Expo Park, built for the Japan World Exhibition in 1970, is the home of Okamoto Taro’s “Tower of the Sun,” a 230-foot- (70-meter-) tall sculpture of concrete and metal, with two outstretched arms and a round golden face. Cultural critic Alex Kerr once called it “a giant creature from outer space put together in a kindergarten art class,” but the Tower has more or less won over the hearts of native Osakans and visitors alike. America-mura, or America Village, is Osaka’s hip young neighborhood. The Village is very close to the Shinsaibashi strip and profuse with galleries, cafes, and boutiques peddling both new and vintage apparel. Nearby Midosuji Boulevard has been called the Champs-Élysées of Asia, but bears very little resemble to the iconic Parisian thoroughfare. The road is lined with gingko trees, which are quite lovely in the late autumn months when the leaves turn a bright shade of yellow. The Sennichimae Doguyasuji Shopping Street is sometimes referred to as Osaka’s kitchen district. It’s where visitors find can find every kind of kitchen utensil imaginable, for prices that won’t exceed your travel budget. There are nicer items like porcelain, and kitschier things like the plastic imitation food. Plates, sake sets, bowls, and lacquerware are sold at wholesale prices, and make great souvenirs for loved ones at home. With a diameter of 328 feet (100 meters), and a height of 369 feet (112.5 meters), Osaka’s Tempozan Ferris Wheel is one of the world’s largest. Next to the Kaiyukan Aquarium, the wheel’s colored lights provide the weather forecast for the following day: orange lights mean sun, green lights indicate cloudy skies, and blue lights represent rain. With gorgeous views of Osaka Bay and the surrounding mountains, there’s no better way to end your trip.